Thomas Blatt is a survivor of Sobibor, the Nazi extermination camp, where he took part in the most successful revolt and escape from any Nazi camp during World War II. "Those of you who may survive, bear witness, let the world know what has happened here." Selected material by Thomas Toivi Blatt. The facts presented on this website are the Historical research and first-hand account of Holocaust survivor Thomas 'Toivi' Blatt, who escaped from the Nazi death camp Sobibor during the prisoner-led Revolt on October 14, 1943. 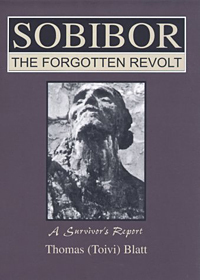 The Sobibor revolt was the most successful revolt and escape from any Nazi camp during World War II. In his search for the truth about Sobibor, Mr. Blatt has extensively researched, investigated and written about its history - the results of which are also presented in two extraordinary books Sobibor - The Forgotten Revolt and From The Ashes of Sobibor. Additionally, the story of the revolt was told in Escape From Sobibor, the award-winning Chrysler Corporation film special of 1987. "The fifth commandment, 'Thou shall not kill,' is not God's commandment at all: it is a Jewish invention." Statement of the high Nazi official Stahle after the protest, on December 4, 1940, by the evangelical priest Sautter against the criminal acts of euthanasia. The mission of this website is to present the true historical facts about the history of the Sobibor death camp and what happened there from the time it was built in April, 1942, until the time it was closed and destroyed in October, 1943. Directions: Click here to view map.